Heightened interest in flying prompts return of Civil Air Patrol unit in N.H. The Mount Washington Squadron is re-established with 32 cadets up to age 21 and 18 senior members. CONCORD, N.H. — A renewed interest in flying has led to the return of a volunteer Civil Air Patrol unit in New Hampshire’s North Country after 25 years. 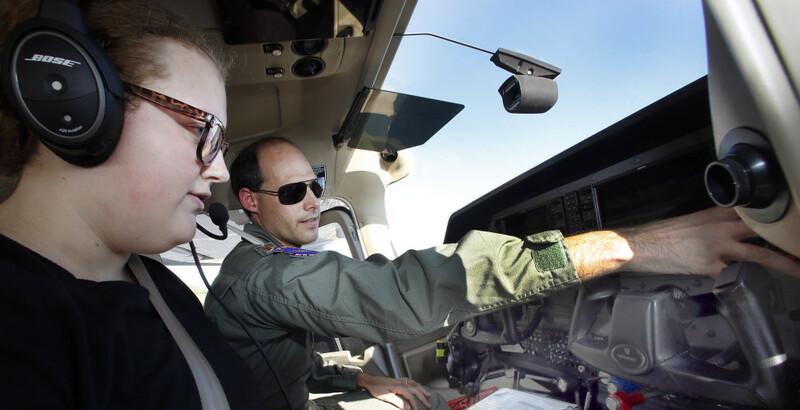 Many members of the nonprofit – young cadets up to age 21 – have just learned how to fly and hope to help their communities with search-and-rescue missions and other services. The Civil Air Patrol started in 1941, a week before the Japanese attack on Pearl Harbor. Its 150,000 members nationwide flew critical missions during World War II, patrolling the Eastern Seaboard in search of German submarines and running search-and-rescue missions. The patrol was permanently established as the auxiliary of the U.S. Air Force in 1948 and, today, is based in Alabama. It consists of 1,500 squadrons and 60,000 volunteer youth and adult members nationwide. The organization says it has surpassed 100,000 flying hours across its fleet for the 2016 fiscal year, more than a 7 percent increase over the previous year. John Desmarais, director of operations, attributes the increase primarily to disaster relief missions, such as recent support for the response to Hurricane Hermine in Florida. New Hampshire’s first squadron and headquarters was established in Concord in the 1940s. More were added in Keene, Laconia, Manchester, Nashua, Portsmouth, Rochester, Lebanon, Milan, Mount Washington Regional Airport and Stewartstown for a total of 12. But the latter three were deactivated in the 1990s in conjunction with the closing of the pulp and paper mills in northern New Hampshire and a resulting sharp reduction in the local population. In May, parents of children who were cadet members of the Laconia squadron became interested in setting up a squadron closer to home, in the North Country. The Mount Washington Squadron, in Whitefield, was re-established and given the numerical designation of 075, in celebration of the patrol’s 75th anniversary this year. The squadron has registered 32 cadets and 18 senior members. Cadets in the Mount Washington Squadron are booking their first flight orientation hours while in the co-pilot seat of a Cessna 172 under control of a Civil Air Patrol senior flight instructor. Soon they will be receiving flight orientation on gliders. They have been taking aerospace education classes. Adult members also are being trained in coordination with other agencies on search and rescue procedures and operations. Cadets who earn cadet officer status may enter the Air Force as an E3 (airman first class), rather than an E1 (airman basic). Squadrons in New Hampshire have conducted fire patrols and checked on the health of forests. They have photographed flooding and tornado damage. Last year, they assisted the Fish and Game Department in the search for a hiker who died during extreme winter weather conditions. When Hurricane Sandy struck in 2012, the New Hampshire Wing invited the Northeast Region’s Area Command Team to set up operations at the wing’s Concord command center. They coordinated more than 400 flights and took more than 150,000 photographs for the Federal Emergency Management Agency. In addition, 60 wing volunteers carried out ground and airborne duties, including 48 flights.